I often times call into the question the external craziness and hysteria that the black LGBT community must endure. The homophobia from the black community drives me crazy. The racism from the LGBT community makes me mad. But child - we have our own issues that make me scratch my head too. I was just doing my daily reading over at The Advocate to hear this strange, bizarre tale of a pageant gone terribly wrong. 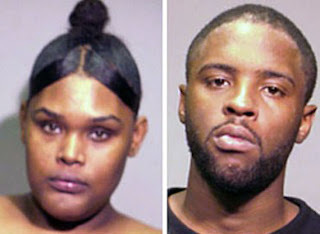 The two individuals pictured here have been arrested for what tthe Advocate refers to as a "gay pageant smackdown." According to the article, Leroy Tinch (to the left in the photo) was a contestant in the pageant. When judge Sebastian Latta cast a vote for a rival contestant, Tinch grabbed a trophy and proceeded to violently bash the judge. Even more confusing about the affair, not only was judge Latta attacked by contestant Tinch, but a fellow judge Anthony Johnson (on the right in the photo) also joined in on the attack. Latta was hospitalized with a shattered jaw and a gashed forehead. Now I'll admit - I've been both contestant and judge for pageants. Yes honey I know - for many this is a serious matter. One girl cornered me outside a bar after reading my comments and learning that I didn't like her shoes. Yes - I was a little scared for my life and that was the last pageant that I ever judged. I will not be killed over some Payless sling-backs. But for real - is this serious enough to risk a man's life and your freedom. For most sane people the answer would be no, but the pageant world is not one with normal people.